You are invited to drop by Zeno's Warbird Video Drive-In In http://www.zenoswarbirdvideos.com to view our March selection of eight exciting films streaming over the Web in broadband, with four premiers including two new Bell P-39 Airacobra fighter videos! Now showing in March "At the Matinee" at Zeno's Drive-In. Free admission! * How to Fly the Bell P-39 Airacobra NEW -- digitally restored. The P-39 was one of the U.S. Army Air Corps front line fighters when world War 2 broke out in the Pacific, but was soon replaced as more advanced aircraft like the P-38 when they became available. It's mid-engine and 37mm canon were virtually unique. This film covers all aspects of flying the P-39, including takeoffs, landings, aerobatics like rolls and loops, and how to control spins & stalls. *P-39s in the News -1942 NEW Restored Color Three short newsreels featuring the Bell Airacobra shown to the American people during World War 2. The first film shows the Bell Aircraft P-39 assembly line in Niagara Falls, New York. Then you'll see P-39s taking target practice. Finally, you'll see Airacobras and P-63 King Cobras flown across the Bering Strait under Lend Lease to Russia. Unlike the US Army Air Force, these aircraft were prized by the Soviets, who used them for ground attack & tank busting. * 9th Air Force 362 FG P-47 Thunderbolts in Action Digitally restored Color I produced this original documentary from dark, faded silent gun camera film footage from the Spring of 1945 over Germany. I've been able to restore it using digital technology. I've added additional info about the pilots and planes and added real P-47 Thunderbolt sound effects. 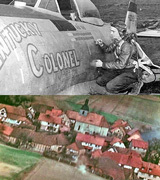 Featured pilots from the 362nd FG are Alvin Lieberman, Robert A Jackson and the legendary Wilfred Crutchfield, flying his P-47 "Kentucky Colonel," attacking a wide variety of ground targets in March, 1945. *The General Dwight D Eisenhower Story NEW -- digitally restored. Covers the life story of "Ike" Eisenhower from his humble beginnings, to West Point, through World War 1, as a rising star between the Wars, and then as Supreme Allied Commander in Europe during World War 2. Eisenhower combined high intelligence, insight, and a grasp of strategy & tactics with a unique ability to manage the fractious coalition of nations and personalities that made up the Allied Forces in Europe. *The Story of the Black Cat PBYs Digitally restored with exclusive additional material. What was that mysterious plane swooping down out of the night sky on unsuspecting Japanese ships and bases, hundreds of miles from any known American airstrip? The answer was, as you'll see in this good humored film, the slow, ungainly, but deadly "Black Cat" PBY. Originally designed as a reconnaissance and antisubmarine amphibious patrol plane, the big twin engined Catalina's super long range, all weather capability, capacity to lug both bombs and radar, ability to loiter for hours hunting convoys and operate from anywhere in the Pacific without an air strip, made it an ideal naval night attack bomber. * Catapulting Off A World War 2 Carrier (Restored) Small World War II aircraft carriers depended on their catapults to operate aircraft. This unique film offers a rare look at how US Navy carrier crews were trained to operate catapults to launch aircraft, even from very short decks. *Submarine Warfare in the Pacific This film was completed shortly after the end of the War and contains rare footage on US submarine operations you won't find anywhere else. There is a cameo appearance by Japanese Fleet Admiral Nagano who discusses (in English) the effect of US sub operations on the ability of the Japanese to make war. That's because the "pig boats" inflicted military and transport losses on the enemy that were far beyond their own tiny numbers. * Denmark Fights for Freedom NEW -- digitally restored The recent tragedy in Denmark (February, 2015) brings to mind the Dane's amazing national fight for free speech & democracy against the German occupation in World War 2, values that endure (and are still challenged) to this day. What if an entire nation stayed home & refused to show up at work to fight an enemy occupation? You'll see that & much more in this dramatic documentary film, surreptitiously shot and smuggled out during the occupation. We also show 1940-45 vintage WWII Army & Navy films and pilot's manuals on how to fly the F4U, F6F, P-38, P-39, P-40, P-47, P-51, P-61, TBF/TBM, AT-6/SNJ, B-17, B-24, B-25, A-20, A-26, B-26, B-29, and Stearman N2S. Alert! - Don’t miss the F-86, B-47 & B-58.